The year 2007 was a very important year in the annals of St Aloysius’ College. In fact during the period October 2007 and May 2008 our College celebrated the 100th Anniversary of its foundation. To mark this unique occasion a whole programme of events was drawn up by a joint organizing committee made up of representatives of the the Jesuit community, the Old Aloysians’ Association and the college staff. Amongst other things it had been decided to issue a Souvenir Booklet covering these last 100 years. Our association had been entrusted with its publication and work on it had already been initiated. Moreover, the OAA donated a statue dedicated to St Aloysius, the Patron Saint of this College, and was erected in the gardens in front of the entrance to the College. 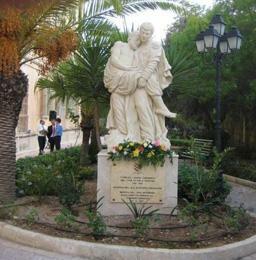 This statue was unveiled and blessed on October 8, 2007 by the Superior General of the Jesuit Order, Most Rev Fr PETER HANS KOLVENBACH S.J., on the occasion of his visit to Malta. You will surely appreciate that these plans require a substantial amount of financial resources and we appeal to each one of you to help us. We are sure that as happened in the organization of the European Congress of Past Pupils in 2001 many of you will contribute and send us donations towards these new initiatives. All donations, indicating towards which initiative they are to be directed - whether it is towards the organization in general, or the publication of the Souvenir Booklet, or the Statue - of course, will be acknowledged. The Superior General of the Society of Jesus, Fr Peter-Hans Kolvenbach, arrived on the October 6, 2007 for a three-day visit to Malta to inaugurate the centenary celebrations of the Jesuit- run St Aloysius' College, Birkirkara. The College first opened its doors for the education and Christian formation of students on October 8, 1907. On his arrival, Fr Kolvenbach was welcomed by the Jesuit Provincial, Fr Paul Chetcuti, the college rector, Fr Patrick Magro, and other Jesuits. Fr Kolvenbach is the 29th Superior General of the Society of Jesus, the largest religious order of the Catholic Church. This is his third visit to Malta, and one of his final three international visits before handing in his resignation in January 2008 after almost 25 years of leadership. During his visit, Fr Kolvenbach held separate meetings with Jesuits, lay collaborators, the college staff and students, as well as an informal visit to the detention centres for undocumented immigrants. On the occasion of the centenary, Fr Kolvenbach celebrated a thanksgiving Mass on Sunday evening at the Jesuits' church in Valletta. All former students, teachers and friends of St Aloysius' College as well as the relatives and friends of the Jesuits together with the general public were invited to attend. Later in the day the Superior General concelebrated Mass for the college staff and students at St Theresa's Sanctuary, Birkirkara. The book written by Fr Darmanin's nephew, Manuel Darmanin, about the experiences of his uncle collected from Fr Darmanin's personal diary in World War II. Since I wrote the short obituary following the death of Fr Salvino Darmanin of the Society of Jesus on February 17, 2001, more facts have come to my knowledge thanks to Fr Arthur G. Vella SJ, my former Jesuit teacher of English of Form II at St Aloysius College during 1956/57. Fr Vella recalls how Fr Darmanin was imprisoned by the Nazis and kept in six prisons and concentration camps. Having been intrigued by Fr Darmanin's close calls with death in the camps, I asked Fr Vella about the source of information and he lent me a booklet written by Fr Darmanin's nephew, Manuel Darmanin, about the experiences of his uncle collected from Fr Darmanin's personal diary in World War II. After completing his secondary studies at the Episcopal Seminary in Floriana, he started his novitiate with the Society of Jesus in Bagheria (Palermo), Sicily, on November 5, 1934. When Italy sided the Axis powers in June 1940, Fr Darmanin was caught in the maelstrom of events of the time. Being the holder of a Commonwealth passport, he was interned in northern Italy but was granted permission to proceed with his studies. Unfortunately, he was taken ill and consequently hospitalised. Following Italy's surrender on September 3, 1943, Nazi forces occupied northern Italy. Hospitals were evacuated, patients sent home and their place taken by injured enemy soldiers. Fr Darmanin was one of the patients recovering from an attack of pleurisy at San Pancrazio Hospital. On September 30, 1943, the Nazis discovered that the young Jesuit student had a Commonwealth passport. He was sent to Milan and, after interrogation at several German offices, he was informed that he was being detained as a civilian political internee. He objected on the grounds that he was a member of a religious society. However, he was ordered to march on to San Vittore civil prison in Milan, escorted by two armed guards. Fr Darmanin was kept in a filthy and dimly lit cell eight by six feet for a couple of weeks. During this short period of solitary confinement he trusted himself in the care of the Almighty, praying: "Our Father Who is in Heaven has His own plans for me". On October 16, 1943 nearly all his personal belongings were confiscated and he was ordered to give up his 500 lire on the assumption that it would be donated to "Christian" charity. The trip to Muhlberg, in train-towed cattle trucks, was very uncomfortable. Nevertheless, Italian women generously threw food to the prisoners of war at various train station stops. Eventually, the POWs disembarked at Moosberg on October 19, 1943 and detained in Stalag VII-A, about 20 miles north of Munich. Initially, the POWs thought that Fr Darmanin was an enemy spy disguised in clerical robes. However, they later realised he was a British subject and that his intentions were genuine. On November 4, 1943, together with 2,400 British POWs he was sent to Altengrabow Stalag XI-A, about 28 miles north east of Madgeburg and 50 miles south west of Berlin. Meanwhile, his family in Malta were extremely worried since they had received no news. But fortune smiled when Fr Giuseppe Delia SJ informed them that Fr Darmanin was being detained in a POW camp. On January 19, 1944, some POWs, including Fr Darmanin, were sent to Elsterhorst Reserve Lazarett 742 Stalag IV-A, about 25 miles south east of Dresden, where he was an interpreter to various Italian and French POWs. In January 1945, a repatriation scheme for several POWs was being worked out but Fr Darmanin was purposely excluded. On February 17, 1945, with the advance of the Soviet armies from the East, the prisoners were ordered to evacuate the camp and move westwards reaching Bautzen. The 240 kilometre-long journey took longer than usual due to continuous air raids. On May 7, 1945, the guards were notified that Russian artillery was very close but they preferred to surrender to the Americans instead. At 10 a.m., they saw the first US ambulance passing by. Ten minutes later they entered friendly territory and were freed. On October 4, 1945 Fr Darmanin was joyfully reunited with his family and gradually regained his health. He has now gone to meet the risen Lord but he has left us a legacy of heroism, which makes the Society of Jesus feel proud and honoured by one of its sons. I am highly indebted to Fr Vella and to Mr Darmanin, Fr Salvino's nephew, for the excellent source of information supplied.